Useful Information | Coolair - Air Conditioning For Work And Home - Covering London, South East, Midlands, Wales & The North. 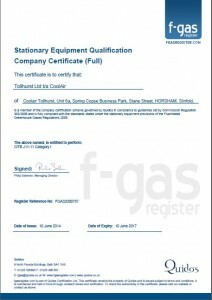 All CoolAir Engineers are FGAS Certified and all hold individual certificates issued by either City & Guilds or CITB. Should you require a copy of our FGAS registration number and/or any of the above certificates, please call us on 01403 791505. Why is it being phased out? Certain refrigerants such as R22 used in the past contain harmful HCFC compounds that are released into the atmosphere and are detrimental to the ozone layer. When will it be phased out? Since 31st December 2009, it has been illegal to use virgin R22 refrigerant gas for service and maintenance of air conditioning systems. From 1st January 2015 the use of all HCFCs including recycled materials will be banned. Stock piling of virgin and reclaimed HCFC R22 is illegal. The Enhanced Capital Allowance structure for energy-saving technologies encourages businesses to invest in energy-saving plant as specified on the Energy Technology List (ETL) which is managed by the Carbon Trust on behalf of the Government. The Annual Investment Allowance provides 100% tax breaks, equal to ECA, available for most new equipment investments up to £100,000 a year (please check for updates). Purchases are not required to be listed on the Energy Technology List.